I just signed my 3 y.o. up for her first bike race, Kelly Cup/BikeJam Kids under 10 race. It's on 5/23, do you guys recommend any specific training or diet guidelines for her to follow? Do USAC rules allow training wheels? Do I need to remove her handlebar tassles, bell, and basket? Thanks in advance, she's prepared to dominate. If this is serious, don't make her train or diet because that will just strew her idea that biking is fun. Race for racing, not for winning at this point in time. When she gets older, you can introduce these compromises because she will know that if she does this and this and this, she will win. Keep it fun. That's a mighty big "if". 1. My son (3 at the time) finishes the race....but isn't done racing. continues to ride around the majority of the crit course. Won't stop. 2. Son is winning his race. New bike. Smile from ear to ear. Downhill run. He's looking at everyone else cheering. Veers off the course. Was never taught how to brake on his new bike. Takes a header into the crowd 5 feet from the line and right in front of dad. Best part of kid racing? he has more hardware than I do. Can you build me a PT on a 14 inch Hello Kitty rim? Technically...I probably could but i might have to put the spokes through the sidewall as they'll end up like 2 inches long. FWIW - pretty sure the flanges aren't rated to be the braking surface. ^nice. my daughter gets a little bashful in crowds, of which there will be a big one provided weather is good. i'll probably have to walk beside/push, 5' before clipping in against a field of pros. i'm working on my excuse now, "i had to push my daughter in the kids race so it forced me to line up at the back then i got dropped." does that sound acceptable or should i just pull a hamstring in the kids race? FWIW - do it without the cleats on. Run in socks. A well placed push with a foot helps maintain position and is often overlooked by the officials. When your daughter is pulled for control that's usually a good time to make your exit. Oh....and have her stay away from happy meals for the week leading up to the event. Turns out there is something in them that will show up on controls. Totally blew little P's shot at World's last season. IS it mass start? Does it count toward the Cat 4 upgrade? my 5 yo nephew did the trikes and trainingwheels (TnT) race at the CSU oval race series last summer. he was barely turning his wheels over at that point but saw me and my stepson racing and wanted to do it. they did like 50 yards or something, not even a full lap. and hes DFL by a LOT for almost the whole way, until one kid gets confused a few feet from the line and turns around and starts going backwards before he crosses, and so my nephew beats him. they all got particpation medals, for the whole week after that he wore it around and he was so excited and told everybody he beat one kid! good question, i just sent an email out to the upgrade coordinator, although it might not meet minimum distance requirements. I'm working on organizing those again right now. They start up in a few weeks. When are you going to start her on her taper? How's her pack riding? Maybe some bump drills this week? 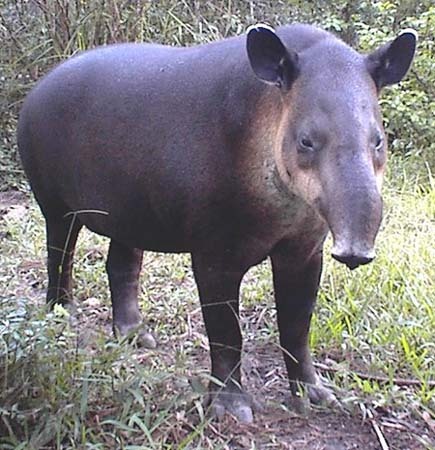 no dude, they're riding bikes, not tapirs. Just remember to have her skip the bacon on race day. I got my son a run-bike when he was three. Awesome. Wish I'd discovered them for his older sister. She's too big for them now and still struggling with training wheels. have her do intervals, 10x10s and make sure that she carb loads several days before the race. Race recovery food: Ice Cream! Pacing intervals and VO2s. Remove the bell, but I think the tassels add a couple watts (I saw a wind tunnel testing report on that somewhere).